With Chris Christie soaring in New Jersey, political junkies will likely have to turn to Virginia's gubernatorial contest for their electoral fix. So far, Republican Attorney General Ken Cuccinelli and former DNC chairman Terry McAuliffe appear on track to secure the two major party nominations without serious challenges. Cuccinelli has irreproachable conservative credentials and the support of the state's conservative base, but it's harder to understand why McAuliffe is poised to receive a pass to the general election. While insider Democrats seem to be closing ranks around McAuliffe, who golfed with President Obama on Sunday, there’s a big opening for another Democrat to make a run for the governorship. After all, McAuliffe ran for governor in 2009 and didn't even make it out of the primary. He was initially deemed the Democratic frontrunner thanks to a modest lead in the polls, fundraising prowess, and Washington celebrity. McAuliffe wound up raising $8 million, out-spending his nearest challenger by more than 2-to-1, and earning endorsements from big-name Democrats, including Bill Clinton. None of this did him much good: He finished in a distant second place, losing by 23 percentage points and claiming just 26 percent of the vote in a three-way contest. McAuliffe's 23-point drubbing in 2009 probably overstates his weakness, since he was hampered by a three-way contest. Third-place finisher Brian Moran, a well-funded Democrat from Alexandria, won a sizable share of the vote in northern Virginia and the cities of southeastern Virginia, where McAuliffe might have otherwise performed well against Creigh Deeds, the eventual Democratic nominee. Deeds surged ahead in the final weeks as voters sought an alternative to the two bloodied frontrunners. McAuliffe also performed relatively well in eastern Virginia, where he pushed hard for the support of African Americans and wound up winning three predominantly black counties. But McAuliffe's weak performance in ’09 can’t be dismissed so easily. McAuliffe's vast resources did not yield an adequate defense against negative attacks launched by Moran, who aired Bain-esque attacks on McAuliffe's business dealings and criticized McAuliffe as a Washington and Wall Street insider. McAullife’s favorability ratings declined throughout the race, and the final pre-election PPP survey showed McAuliffe finishing the campaign with a favorable impression among just 40 percent of Democratic primary voters, with an equal 40 percent holding an unfavorable impression. While one might suspect that northern Virginia would have been McAuliffe's strength were it not for Moran's local appeal, McAuliffe was especially unpopular in northern Virginia, which represented 36 percent of the '09 primary electorate. PPP surveys consistently showed McAuliffe with net-negative favorability ratings among Democratic primary voters in northern Virginia area codes (571/703), averaging an unimpressive minus-9 rating over their final five polls from March through early June. As his standing deteriorated further over the last month, McAuliffe's favorability ratings in northern Virginia area codes finished at minus-15, 36 favorable to 51 unfavorable--his worst region in the state. McAuliffe could make up for weakness in the D.C. suburbs by performing well in eastern Virginia. While most perceive northern Virginia as the base of the Virginia Democratic coalition, black voters play an equal role; about 49 percent of Democratic primary voters in the ’09 gubernatorial contest hailed from eastern Virginia, including Richmond and the Tidewater. But eastern Virginia might be most accurately described as McAuliffe's least bad area. McAuliffe's concerted efforts to appeal to black voters yielded a better showing in eastern Virginia than elsewhere, but he still only won 32 percent of the vote in a three-way race. The pre-election PPP polls showed that McAuliffe's favorability ratings among black voters were indeed better than his ratings among whites, but his plus-14 rating was no better than his opponents' numbers. Ultimately, McAuliffe enters the '13 contest without any proven base of support. That's not surprising, since McAuliffe has never held public office and candidates seeking a higher office often attract lasting support from voters in their home districts. Still, in a low-turnout primary familiarity and past loyalty can make a difference and McAulifffe doesn't have either. Indeed, a recent Quinnipiac poll showed that 65 percent of Democratic voters had no opinion of McAuliffe. Although there are not many recent surveys, the available data indicates that McAuliffe remains as vulnerable as the ’09 primary results suggest. Most remarkably, a September Washington Post poll found that just 16 percent of registered Democrats said they would definitely vote for Terry McAuliffe if he were the Democratic nominee for governor, while an even greater 18 percent of registered Democrats said they definitely would not vote for him. In comparison, 25 percent of registered Republicans say they would definitely vote for Ken Cuccinelli, compared to 14 percent who say they would not. Similarly, a May Washington Post poll found that just 31 percent of Democrats have a favorable impression of McAuliffe, compared to 23 percent with an unfavorable view. So far, most speculation about a possible challenger centers on Tom Perriello, a former representative from Virginia’s 5th congressional district and the president of the Center for American Progress Action Fund. Recent reports indicate that Perriello is mulling a bid and it’s not hard to see why. Perriello has solid liberal credentials and earned the support of activists for his insistence on defending the Obama administration’s policies during his failed reelection bid in a relatively conservative congressional district. Perriello's narrow defeat in the 2010 midterm is considered one of the more impressive electoral performances of the cycle. If Perriello challenged McAuliffe, the former DNC chairman would be in a difficult position. While McAuliffe's financial resources and support from the Clintonistas make him a more formidable candidate than his polling numbers, those same assets were only worth 26 percent of the vote four years ago. McAuliffe remains vulnerable, and Perriello, who has a reputation for authenticity and knows how to deploy a populist message, seems well-suited to capitalize. Perriello's appeal with liberal activists would be an asset, since they make-up the core of the Democratic primary electorate in a low-turnout election. With McAuliffe potentially weak in northern Virginia and Perriello strong in western Virginia (he hails from Charlottesville, and his old district in west-central Virginia represents 8 percent of the primary electorate), McAuliffe's ability to perform well among black voters in eastern Virginia might be the decisive question. But there's plenty of footage of Obama praising Perriello, and little reason to assume that Perriello would be weak in the eastern part of the state. 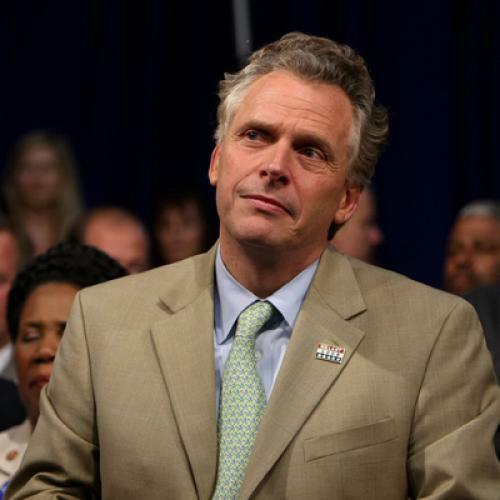 McAuliffe could easily lose a Democratic primary. No candidate who outspends his opponents and only wins 26 percent of the vote in a three-way primary without an incumbent should be considered anything more than an ordinary candidate, at least in terms of his electoral ability. Despite the fanfare, that’s the most that should be said about McAuliffe. We know that a candidate can decisively capitalize on McAuliffe weaknesses, since it happened four years ago. When McAuliffe was golfing yesterday, he probably should have lobbied the president to offer Perriello a cushy appointment.